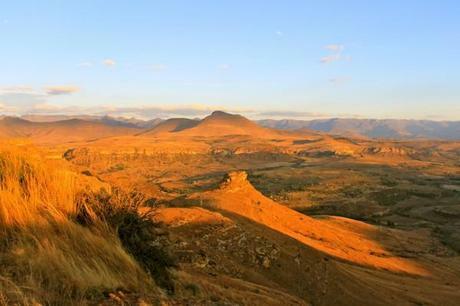 Lesotho is a country completely surrounded by S. Africa, bordered by the Drakensberg in the east, a UNESCO World Heritage Site in S. Africa that offers up some of the most dramatic landscape I’ve ever seen. It’s landscape fascinates me as does the fact that I know so little about it. It’s possible to reach Lesotho by climbing the peaks in the Drakensberg in which you are required to show your passport. I am intrigued and full of questions, like how did Lesotho end up surrounded by S. Africa without being encompassed by S. Africa? How different is the culture? Do Zulu people also live in Lesotho? Do they speak Afrikaans or do they have their own language? And of course, I’m hoping there are baboons in Lesotho. I hope to gain a better understanding of Lesotho, its land and it’s people when I’m there in August after only having glimpsed at it from just outside the S. Africa. What do you know about Lesotho? This post has been submitted to Nancie at Budget Travelers Sandbox where you can see more travel photos.